This entry was posted in Government, Politics: National and tagged Government Shutdown, Liberal, Pentagon. Bookmark the permalink. Not sure why the Pentagon is more “legit” than others. I mean, from a libertarian perspective you should want massive military spending cuts, since we have far more than is necessary to protect the homeland from invasion, and most of our military activity is kind of imperialistic. The Republican military President Dwight Eisenhower called it right when he warned about the “Military-Industrial-Congressional-Complex” (his speech writers made him take out the Congressional part). If the government shut down shrinks the Pentagon, that is a bright spot! Not sure why the Pentagon is more “legit” than others. The defense of the nation is more legit than the Department of Education. I mean, from a libertarian perspective you should want massive military spending cuts, since we have far more than is necessary to protect the homeland from invasion, and most of our military activity is kind of imperialistic. 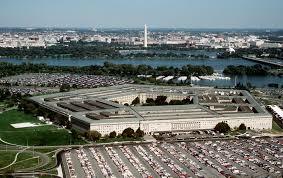 If the government shut down shrinks the Pentagon, that is a bright spot!